A six-alarm fire burned through a Fishkill warehouse that serves as the Gap's regional distribution center. 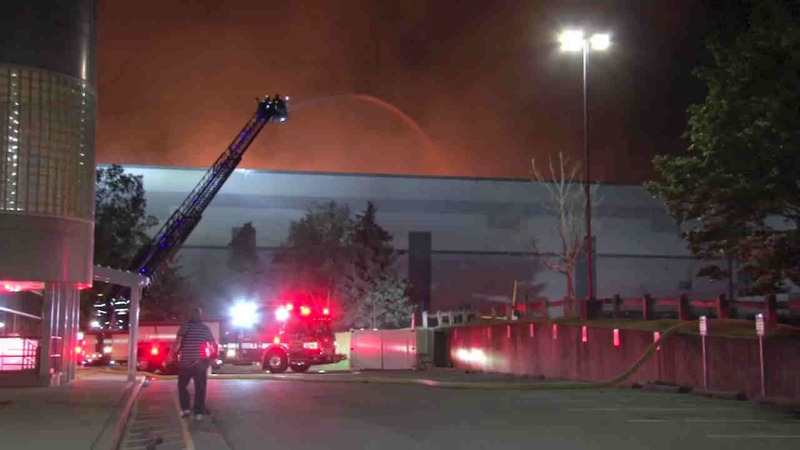 FISHKILL, New York (WABC) -- A huge six-alarm fire burned through a Fishkill warehouse that serves as the Gap's regional distribution center. The blaze broke out just before 11 p.m. Monday in the Merritt Boulevard building, shooting fire into the air. Firefighters battled the flames for four hours before getting the upper hand. The fire was mostly out by 8:30 a.m. Tuesday but firefighters were putting out hot spots in one building. A third of the million square foot building is damaged; damage estimated at more than $1 million. More than 100 Gap employees were evacuated, but none was injured. One firefighter sustained a cut to the lower leg. Gap spokesperson Debbie Felix said "all employees who were onsite at the time have been confirmed safe and accounted for. Safety is our top priority, and we are working closely with local emergency agencies that are responding to this incident." The facility is alongside Interstate 84, where it intersects with Route 9. Both major roads are open. The facility opened in September 2000 and expanded a year later. Gap announced plans in 2014 to add 1,200 jobs over a five-year span, and invest $96 million into the Fishkill facility. At the time of the announcement, the facility had more than 425 employees. The cause of the fire is under investigation by the state police, ATF, the New York State Office of Fire Prevention and Control, and the Dutchess County Fire Investigation Division.